Jim Nickel, Acting High Commissioner, Dr. T. Sampath Kumar. Julia Bentley, Head of Political & Economic Affairs Section, and Robert Hamilton, Head of Development Section. On the occasion of National Public Service Week (June 12-18) of the Government of Canada, Dr. T. Sampath Kumar who works at the Canadian High Commission, New Delhi as a Senior Advisor (Development) has been awarded by the Vice President of Canadian International Development Agency (CIDA), Ottawa, Canada for his exceptional contribution throughout his career including outstanding contribution to CIDA’s civil society program in India. The Vice President Mr. Darren Schemmer, Partnerships With Canadians Branch in his Certificate of Appreciation thanked T. Sampath Kumar for his unwavering professionalism and dedication. 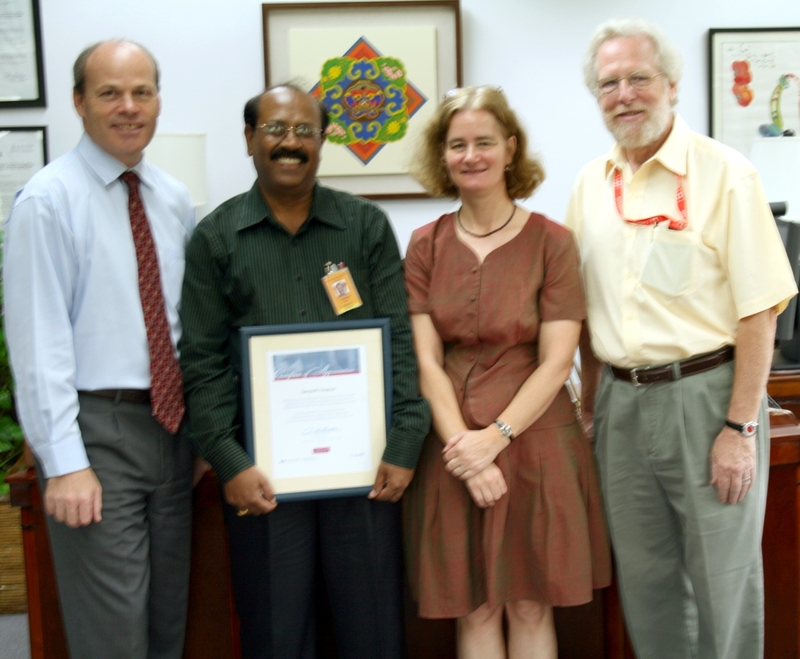 T. Sampath Kumar has been working with CIDA at the Canadian High Commission for the last 18 years. This is his fourth award from the government of Canada for his initiatives, professionalism and excellence. The Appreciation Certificate was given by the Acting High Commissioner Jim Nickel at the High Commission. Dwarka Parichay Congratulates Dr. T. Sampath Kumar, resident of Sector-12, Dwarka for his achievements.